After Tech’s week one shutout win over Alcorn State, Paul Johnson proclaimed his disappointment with the offense that had just scored 34 points. Imagine then, what Johnson must be feeling about his defense and special teams a week later. The two units combined to yield a ghastly 49 points to a South Florida team with brand new starters across the board, including journeyman quarterback and former top recruit Blake Barnett. Barnett, in particular, had his way with the Tech defense after an early interception by Christian Carpenter. The once-Alabama —and once-Arizona State — signal-caller threw for 200 yards and a pair of touchdowns, while adding another 86 yards and a score on the ground. To be clear, Barnett is no TaQuon Marshall or Jalen Hurts. He rushed for more yards against Tech than he had in his entire college career prior to stepping on the field last Saturday. As for the special teams unit, the issue this week was allowing receiver Terrence Horne to return two kickoffs for touchdowns in the first quarter. 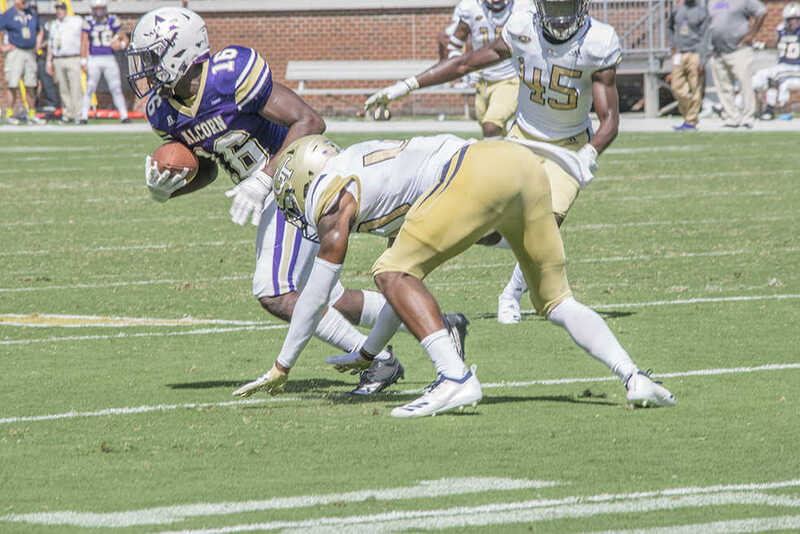 The Tech offense would march down the field and watch helplessly as their lead was immediately erased by the speedy Horne, helped by miscues on the part of the kick coverage team. That is not to say that either of these units played irredeemably poorly against the Bulls. Brenton King was perfect on extra point attempts and tacked on a field goal. As for the defense, Kyle Cerge-Henderson, a Tampa native, lived in the South Florida backfield, notching a pair of sacks and another tackle for loss. But for anyone looking at the Jackets’ dominant season-opening win as proof positive that the team’s lingering problems from the 2017 campaign were solved should look again. Nate Woody has had the chance to install his scheme, but not to pick his players; defenders have moved around from their previous roles to fit positions in his system. Only when he has the chance to handpick and recruit his own talent will fans really be able to determine whether his approach is the right one. Special teams is another case altogether; the team did not stop kicking to Horne after his pair of scores, instead letting him return another three kicks. Horne finished with 298 return yards as the first player since Cal’s Trevor Davis to return a pair of kicks for touchdowns in a game. Whether it is putting more veteran players in the special teams lineup, practicing kick coverage and tackling more in practice, or just squib kicking the ball more often, the Jackets need to find a way to ensure that conference opponents cannot abuse Tech on special teams the way South Florida did; after all, nearly every team remaining on the Jackets’ schedule has an explosive playmaker who could be useful in the return game. No, the offense was not faultless — Qua Searcy had a crucial fumble, as J.J. Green did in the season opener against Tennessee last season, and the passing attack was worthless late in the game — but there is enough there to suggest that unit will be sufficient to propel the team to bowl eligibility if the defense and special teams improve. That remains a large ‘if’.